100,000 Woman Wanted is an article published in the Daily Mail on 13 july 1914, including a part of an interview with Arthur Conan Doyle. Sir A. Conan Doyle on Canada's Need. 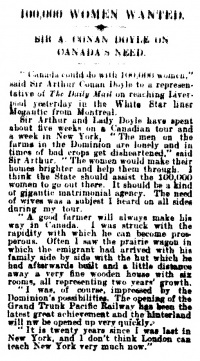 "Canada could do with 100,000 women," said Sir Arthur Conan Doyle to a representative of The Daily Mail on reaching Liverpool yesterday in the White Star liner Megantic from Montreal. Sir Arthur and Lady Doyle have spent about five weeks on a Canadian tour and a week in New York, "The men on the farms in the Dominion are lonely and in times of bad crops get disheartened," said Sir Arthur. "The women would make their homes brighter and help them through. I think the State should assist the 100,000 woman to go out there. It should be a kind of gigantic matrimonial agency. The need of wives was a subject I heard on all sides during my tour. "A good farmer will always make his way in Canada. I was struck with the rapidity with which he can become prosperous. Often I saw the prairie wagon in which the emigrant had arrived with his family side by side with the hut which he had afterwards built and a little distance away a very fine wooden house with six rooms, all representing two years' growth. "I was, of course, impressed by the Dominion's possibilities. The opening of the Grand Trunk Pacific Railway has been the latest great achievement and the hinterland will now be opened up very quickly. "It is twenty years since I was last in New York, and I don't think London can teach New York very much now."